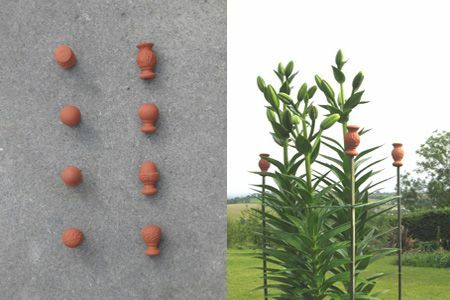 Pretty little terracotta tops to beautify your canes and protect your eyes at the same time. Made in England but supplied to us from Scotland. Standing between 5cm & 3.5cm tall and currently available in 4 designs shown from top to bottom: Thistle, Ball, Acorn & Raspberry. All should accept a cane of up to 1cm diameter. NB NB NB - AS OF JUNE 2018 WE HAVE VERY FEW OF THESE LEFT WITH NONE MORE CURRENTLY AVAILABLE FROM THE MANUFACTURER. IF YOU ARE THINKING OF ORDERING PLEASE TELEPHONE FIRST TO CHECK AVAILABILITY.